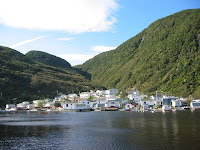 Back in 2000, having read Joseph Garland’s book Lone Voyager, my kayak and I were compelled to make a pilgrimage of sorts to a small ‘outport’ village located 21 miles to the east of Burgeo (and the Ha Ha) on Newfoundland’s south coast. The events that set the book’s story in motion happened at just about this time of year one hundred and twenty seven years ago in a world without cell phones, gps, or radar. On the morning of January 27th in 1883, Howard Blackburn, a fisherman from Nova Scotia, found himself in dire straits. His dory-mate, Thomas Welch from Newfoundland, lay curled up dead in the stern of the fishing dory that Blackburn found himself desperately rowing in an attempt to reach land. Having lost his heavy wool mittens, while bailing during the previous day and night, Blackburn had allowed his bare cold hands to freeze to the wood handles of the boat’s oars. He knew it was his only hope for if his hands had closed, he would never have been able to get them once again around the oars. This was all happening in mid-winter on the Burgeo Bank fishing ground, roughly 60 miles or so from the south coast of Newfoundland. Blackburn and Welch, both in their 20s, manned one of the 6 banks dories that launched from the Gloucester fishing schooner Grace L. Fears 2 days earlier on January 25th. Each 2-man crew set out nearly a mile and a half of lines with hooks baited for halibut and returned to the schooner for a mug-up. However, after only 2 hours, the schooner’s Captain, Alec Griffin, sensed impending bad weather and sent the men back out to retrieve their lines. Blackburn and Welch rowed out to their line and had just finished retrieving the mile-long string when a sudden and severe squall swept across the area bringing with it blinding snow, and fierce winds that kicked up heavy seas. While busy fighting to keep their small boat from being swamped, they lost sight of the Grace L. Fears. One man bailed furiously as the other tried to keep the bow into the wind and waves. When the snow finally let up and darkness had descended, they could see a torch had been lit in the rigging of the schooner far to the windward. Despite their best efforts, they were unable to make any headway and had to lay anchor until morning. When they scanned the horizon at daybreak on the 26th, there was nothing but heavy seas, sullen skies, and a wind that wouldn’t quit. The men decided to row towards Newfoundland but were forced by the wind and seas to spend most of the day taking turns at bailing the boat resulting once again in little headway being gained. Just before dark, Welch did not respond when it was his turn to bail. He told Blackburn that it was no use and began a steady slide into the waiting arms of a merciful death. Later that night, Blackburn moved the lifeless body of his dory-mate to the stern where it served as ballast. This left Blackburn all alone and he began his steady, cold and agonizing row for land. The wind had finally subsided and the seas were now nearly calm. He rowed all day and just before dark he sighted land far in the distance. With darkness setting in he stopped rowing, set out his crude sea anchor, and rocked away the cold night in the dory with his dead dory-mate. On the morning of the twenty-eighth, a Sunday, Blackburn passed to the east of an island that looked to be unoccupied. Had fate been kinder and he’d passed to the island’s west, he would have seen a village where refuge could have been found. Instead, he rowed on toward the line of rugged hills that rose up from the mainland to the north. Ultimately he found himself rowing against a current of black brackish water which he followed to a narrow opening between 900 foot high hills and entered the Little River fjord. 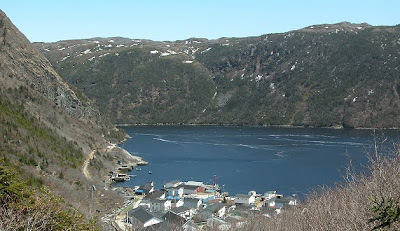 On the fjord’s west side, within sight of its narrow mouth but out of the main channel, was a fisherman’s wharf or “stage” as they are called in Newfoundland. Nestled at the base of the steep hill near the stage was a decrepit hut. Blackburn tied off the dory, went ashore, and spent the night pacing the floor and looking at the stars through holes in the hut’s roof. Though there was an old bedstead inside, Blackburn feared that if he lay upon it, he most likely would never arise. When daylight returned, he went out to the dory and found it damaged and full of water from being pushed against the rocks during the night. After emptying the boat, he ruptured his abdomen while attempting to lift Welch’s body, and had to push his innards back in as he helplessly watched his dory-mate’s body sink in about 12 feet of water. Back in the damaged dory he rowed out of the fjord and looking to the east saw two vessels becalmed in the distance. As he rowed in their direction, the wind freshened and the boats disappeared. His hopes dashed once again, he returned into the fjord and rowed along the east side,until after fighting the out-flowing current for 3 hours,finally saw several cabins clustered in the distance. As he approached the cabins, he encountered the iced-over portion of the river. A couple of people walking from one cabin to another saw him in the moonlight and walked across the ice to his rescue. Blackburn refused to leave the dory until his rescuers promised him they would immediately row to where Welch’s body lay submerged and retrieve it. Two men set out to perform this task while others helped Blackburn to one of the humble cabins where he would spend the next three months in their care. Despite their best efforts and empirical knowledge of home remedies, he would ultimately lose all of his fingers, half of each thumb and 5 of his toes to frostbite. The people of Little River were themselves impoverished that winter after having experienced a disastrous fishing season in which the capelin never appeared. What little food they had was freely shared with the man fate had sent their way. Because of their help, Howard Blackburn survived his ordeal and later settled in Gloucester, Massachusetts. He supported himself by running first a smoke shop, then later a saloon, and became a living legend in one of America’s busiest fishing ports. It seems he spent the rest of his life trying to prove that his survival was not due merely to luck, but rather due to his rare strength of character. He demonstrated this by twice sailing a small boat solo across the Atlantic earning himself the title “The Fingerless Navigator”. A third attempt at the age of 43 did not succeed and nearly killed him. He lived out the remainder of his life in Gloucester and finally succumbed to a variety of ailments at the age of 73. He is buried in Gloucester’s Fishermen’s Rest Cemetery. The village of Little River still exists, but today is called Grey River. The name was changed due to its being confused with another village of the same name in the early 1900’s. During an outbreak of measles, medical help was unfortunately sent to the other Little River by mistake resulting in tragedy and the subsequent name change. 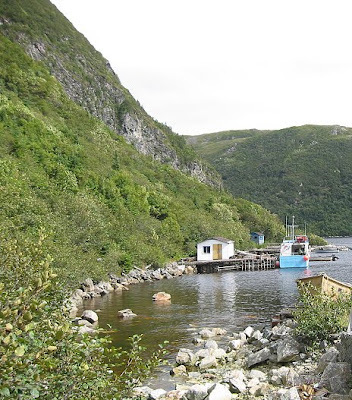 Though only 21 miles down the coast from Burgeo, Grey River is not accessible by road. The only way to get there is by boat, coastal ferry, or helicopter. The coastal ferry, M/V Gallipoli transported my boat and I to the village when I first visited in 2000. The descendents of the family that saved Blackburn’s life still reside there and I was fortunate enough to meet several of them. With their help, I was able to see the spot where Blackburn found deliverance in the family’s cabin. I was also able to launch my kayak into the river and paddle out to the river’s narrow mouth where the small stage and unoccupied hut were located. This desolate spot was tucked only a little ways in from the open ocean. Steep, rocky hills rise to 900 feet on both sides. I tried to imagine what Blackburn endured that first night in the hut. Truth is I really can’t! All of the photographs in today's post were borrowed with permission from the Grey River Community web site. So whenever I'm having a tough day, I need only think of Howard Blackburn's ordeal to find my troubles pale by comparison! I'll be looking forward to turning the page on my calendar next Sunday!